List building. It’s core to a digital marketer’s practice. Facebook Messenger offers more ways than any other channel to capture new contacts. Adds engagement to what you’re doing on Facebook already! And with MobileMonkey it’s easy to do. Grow Messenger Contacts with What You’re Already Doing: Turn engaged commenters into lasting contacts. Need we say more? Add Immediate Engagement to Your Promoted Posts: Get more value from boosted content by automatically following up. 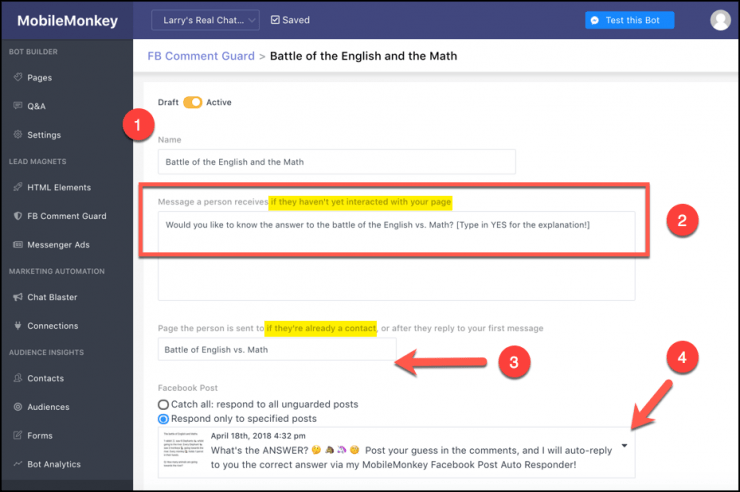 Implement Facebook Post Autoresponders with Ease: Create your autoresponder content then pick a Facebook post to add it to. It’s that simple. Build Your Messenger Contact List! The Comment Guard lead magnet is just about the easiest way to grow your Facebook Messenger Marketing contact list — because you’re already posting and promoting content on Facebook. MobileMonkey’s takes what you’re already doing with organic and promoted Facebook content and turns it into a valuable lead magnet. There’s really no other way to connect in a lasting way opt-in simply from having a conversation in comments online. Get more value from Facebook content by turning engagements into leads and contacts you can follow up with. 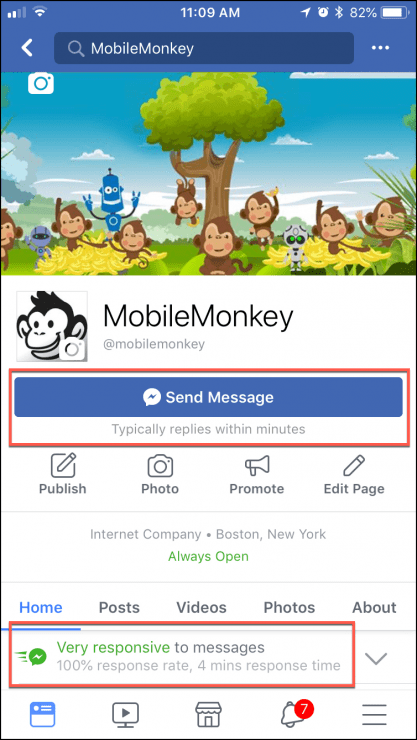 With just a few steps MobileMonkey, add a Comment Guard to a Facebook post that will grow your Messenger contact list and add engagement to your post. Step 1: Create a new Comment Guard and name it. Step 2: For people who aren’t already a Facebook Messenger contact create an autoresponder that’s relevant to the post content and invites a response. As soon as they reply, they’re opted in! Step 3: Send them to the Messenger chat landing page you designed for this post engagement. Step 4: Pick the post to add the Comment Guard. And like that, your Facebook commenters are contacts in your Facebook Messenger list. When you boost Facebook content you’re taking the extra step — and budget — to get it in front of more of your audience. 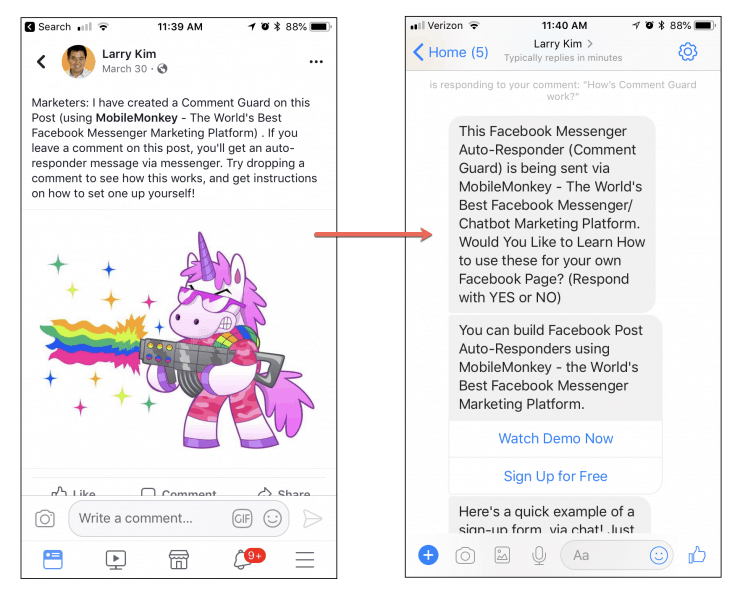 Comment Guard lets you follow up with your engaged commenters with an automatic response in Facebook Messenger. Level up the immediacy of your engagement! Rather than broadcasting a one-sided promotion, Comment Guard opens a door to sending follow-up content that nurtures your customer relationship. Custom content experience, mission accomplished. Your Facebook Posts for Free Today!